What a beautiful facade! It must be Italy? No, it's Massachusetts! 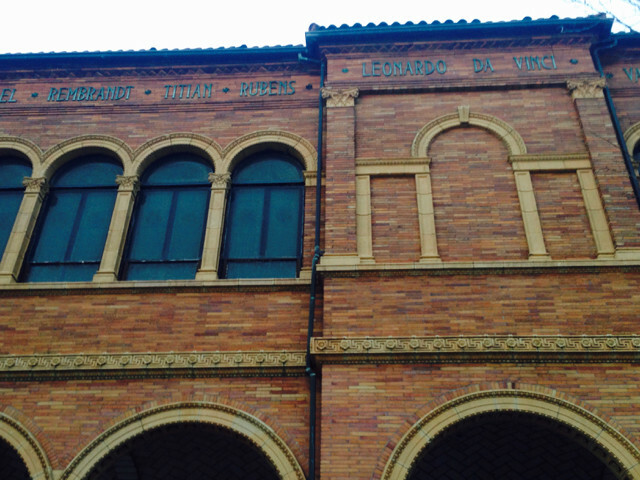 The Italian Palazzo-styled architectural facade of the George Walter Vincent Smith Art Museum in Springfield, Massachusetts, to be exact, one of my new favorite small museum finds in the US. 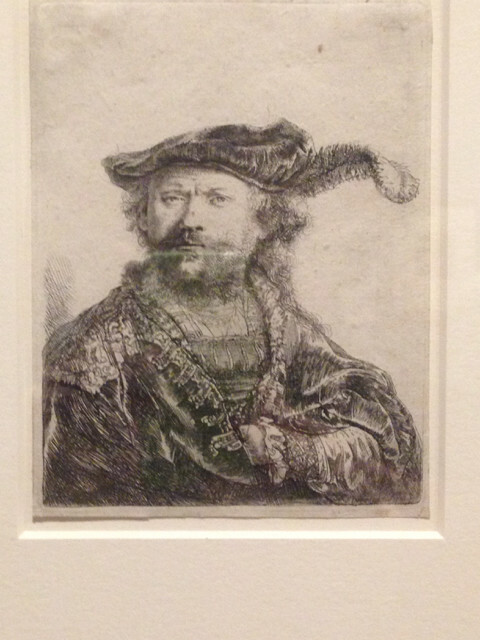 As I mentioned in my recent post recounting a visit to the Mead Art Museum in Amherst, MA, there are a lot of benefits to visiting small art museums. Massachusetts has many such treasures beyond the remarkable MFA in Boston, and on this Holiday trip I set out to check out a few of them. 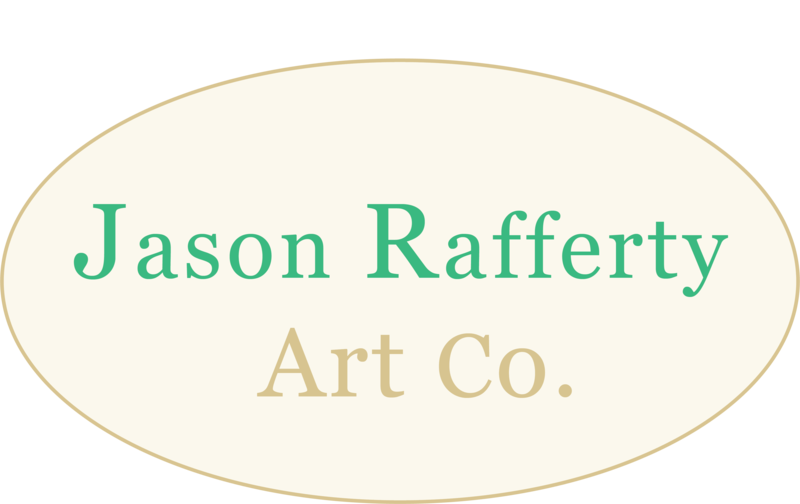 I took a road trip from my home town of Norfolk, MA to Springfield - an easy hour and a half on the highway - to go check out their fine collection of European and American paintings and sculptures. Let's delve in, shall we? Note the great painters' names made monumental on the top of the building. I love love love this stuff! And check out that architectural detailing! 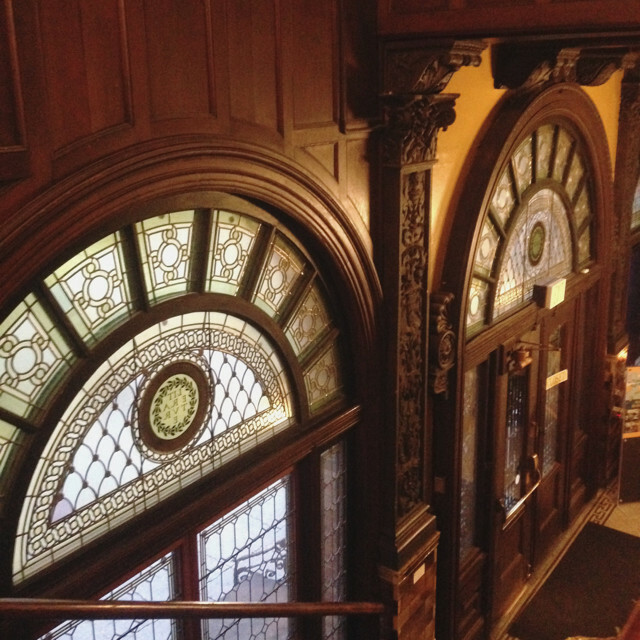 The sumptuous interior of the George Walter Vincent Smith Art Museum, complete with Tiffany Glass windows and extensive carved wood. 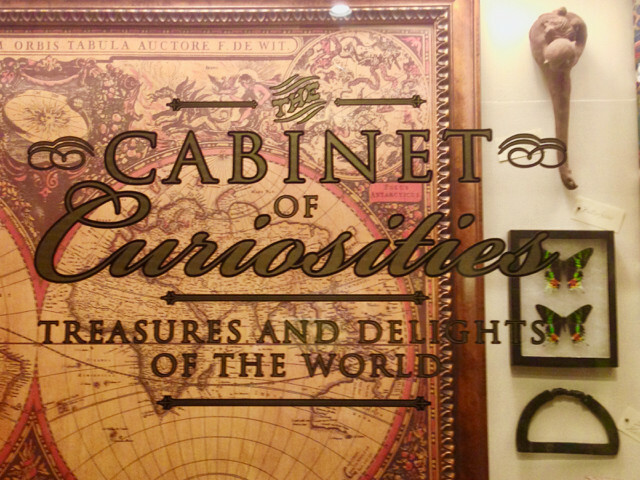 Like any proper European Drawing Room, this museum had a nice Cabinet of Curiosities right at the entrance. Or as I prefer the term as I saw it once while museum-ing in Belgium, "Wunderkabinett", or Wonder Cabinet. (I like to habituate 17th-19th century drawing rooms, they're like, my place.) A similar word is "Wunderkammer", which wordnik.com describes as a "'chamber of wonders,' - exhibition spaces in which miscellaneous curiosities — odd and wondrous rarities — are brought together for private contemplation and pleasure." These museums certainly served such a role hence my title for this series of blog posts. 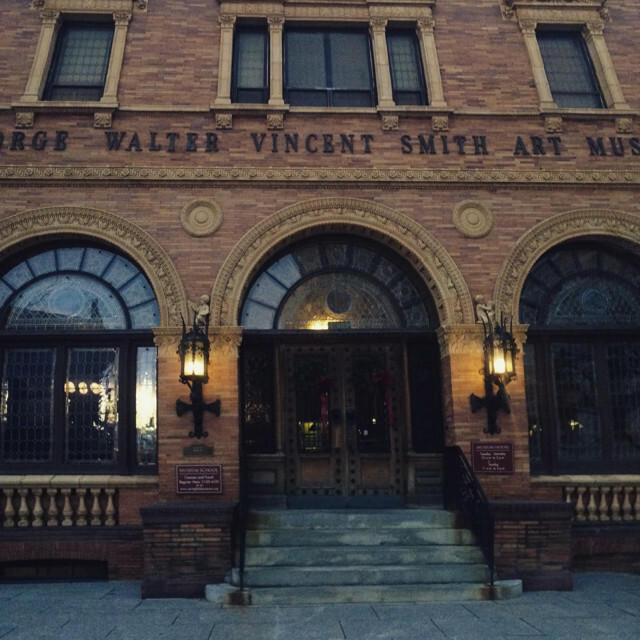 I started out in the D'Amour museum of Fine Arts, across the way from the Vincent Smith museum. Springfield has an excellent setup that is effectively a grassy qudrangle that has museums facing each other on each side - two Fine Art museums, a History museum, Science Museum, a beautiful Italianite Public Library, and a nascent Dr. Seuss Museum (the creator of the series being from Springfield.) One ticket covers admission to all of them (! ), so I got the student ticket and went right at it. George Inness - "Clearing Up", 1860, oil on canvas. 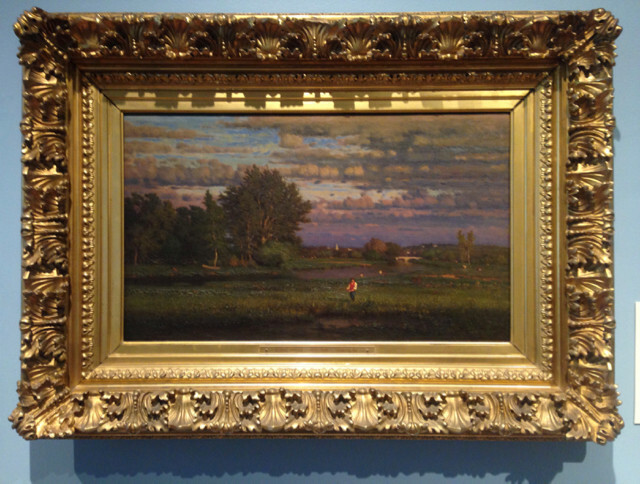 The D'Amour museum has some excellent examples of 19th Century American landscape painting, including this one by George Inness, the most emotive and poetic painter of the era in my opinion. Just take in the deep space; the careful layering of clouds; the spot-on vibrating juxtaposition of lilac in the distant sky against the earthy sienna of the trees on the horizon. He gives us lushous atmosphere without sacrificing fine drawing skill. There is a dance of movement in the trees, just as real trees have. And as a final touch, the red shirt sets off the whole piece like a flicker of flame. Masterful! Frederic Edwin Church - "New England Scenery", 1851, oil on canvas. Artist Age - 25 y.o. While Inness is the poet laureate of American landscape painting, Church is the consummate virtuoso - the Franz Liszt, the Paganini. I was dazzled by this early masterpiece of his - an amalgamation of classical New England Scenery from the picturesque era - which perhaps, like the classical concept of 'Arcadia' or 'The Golden Age', is an era hailing from myth and imagination. 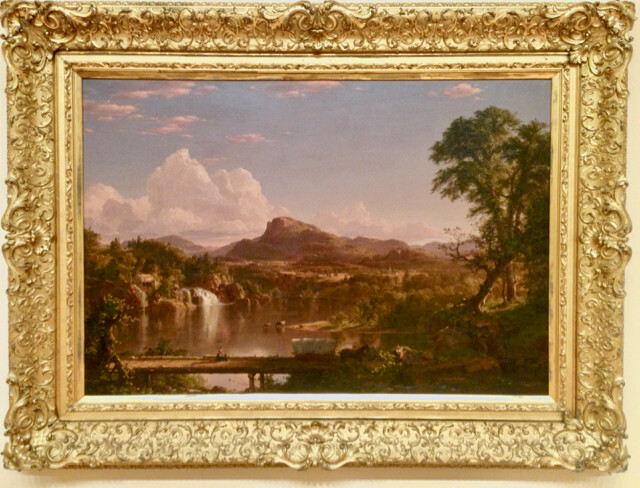 Rather than painting actual views of scenes, Church learned from his teacher Thomas Cole, founder of the American landscape school, the art of assembling many motifs into a comprehensive, panoramic "ideal" view, lit by a unifying atmospheric light effect. (This aspect of Cole's work is discussed in my previous museum post.) Here, "Nature and civilization exist in perfect balance", reflecting Church's "cosmic vision of nature", according to the museum's description of the piece. Let's see some details below. 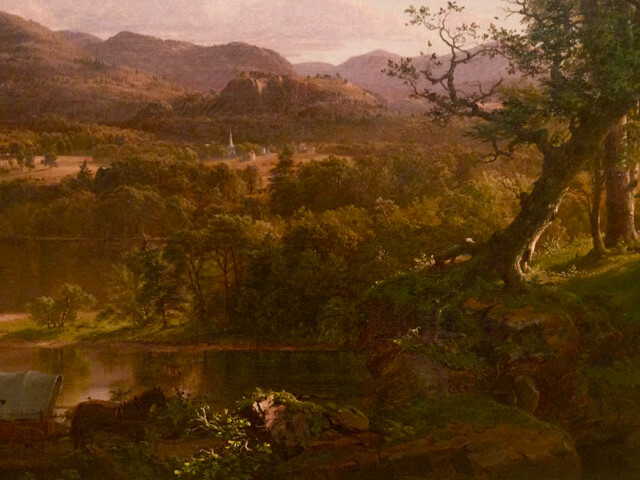 (detail) Frederic Edwin Church - "New England Scenery", 1851, oil on canvas. Look at those clouds! Do you have your opera glasses or your monocle handy? Heheh, I say that in truthful jest because back in the 19th century, Church would stage public unveilings of his richly detailed paintings, and people would come and pay a ticket price to attend a viewing - like a precursor to cinema. Also like cinema, new paintings would be reviewed by critics in the newspapers and either be praised or verbally torn to shreds! Those were the days... Anyway, opera glasses would be provided so that spectators could better zoom in on and observe the copious details embedded within his pieces. Church's penchant for infusing his works with accurate botanical scientific observations gives his paintings a rare veracity. I remember reading once that one contemporary observer remarked in admiration, "few are given such skill." 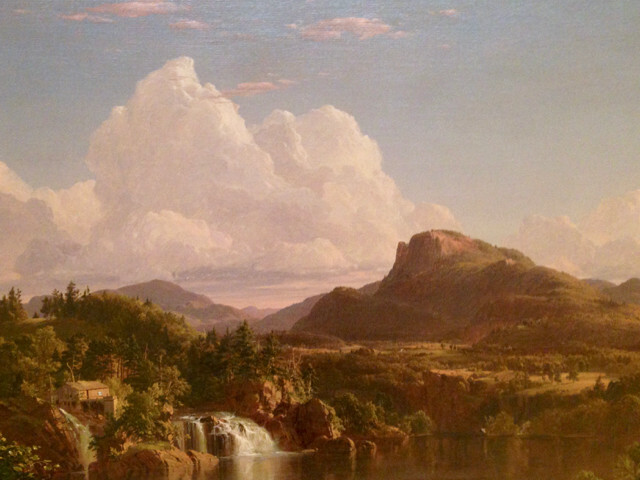 (detail) Frederic Edwin Church - "New England Scenery", 1851, oil on canvas. Look at the bold spot of raking light on that rock and bit of foliage - everything else is shadow. Not an accident, that - What a baller! He didn't neglect the classic white New England steeple on the horizon either. Such sights are still a regularity, such as in my quaint picturesque hometown, Norfolk, MA. 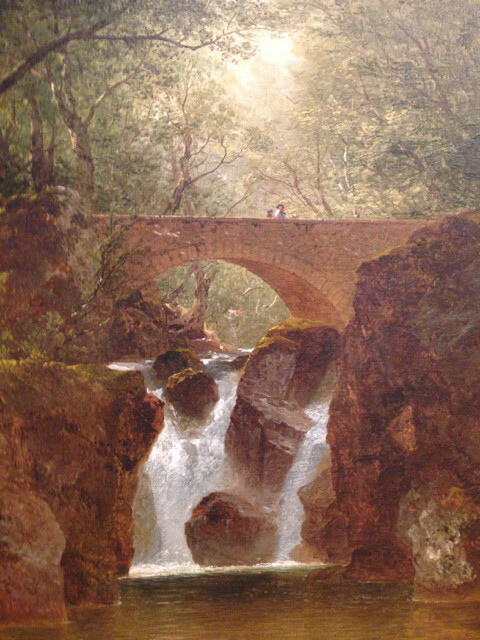 (detail) John F. Kensett - "Ryder Falls, Lake District, England", 1858, oil on canvas. This one is nuts, look at the fanning movements of the trees and rocks - Kensett captures the vivid still animation of nature in this sharp landscape. The water is not the only thing flowing here. And look how he sets the pearlescent white of the falls agains the siennas, raw and burnt umbers, and ochre tones of the rocks. The shimmering light dappling through the treetops may be more wishful fabrication than reality, as the description aside this painting noted Kensett's constant complaining in his journals about the incessant England rain during his trip there in this period. He would have created this painting not en plein-air, like the impressionists, but back in the studio in order to elaborate out this kind of careful detailing. 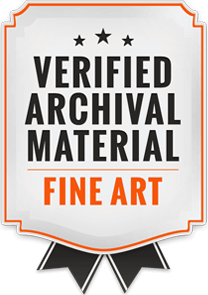 However it would be informed by detailed in-person drawings in graphite or chalk, and / or perhaps watercolor studies on-location. To pull off such a painting as this from memory with only a drawing as an aid requires a highly developed, well-practiced pictorial imagination. Like a high-level athlete, such an impressive performance requires untold amounts of prior training. Remember, it's 1858, photography was still in its infancy. 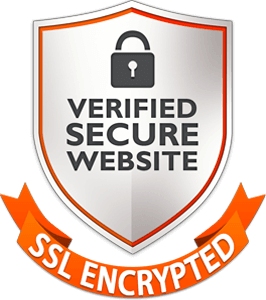 I think we've chewed on enough for this blog post. 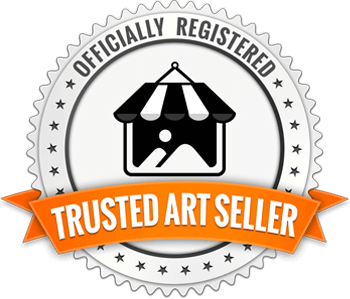 Happy New Year and join me on the next post as we discover the amazing European figurative art collection in this Springfield Wunderkabinett.